There was a time when albums would regularly clock in somewhere between 28 and 38 minutes in length. Never too long nor too short, they were focused efforts that wasted little time in getting straight to the point. Songs that weren’t up to par and those that didn’t fit within the scope of a project were left on the cutting room floor. True, there were, on occasion, some golden nuggets left behind, but these generally resurfaced on a future outing, if indeed, they truly had any merit. More often than not, the editing choices that trimmed down a release were made wisely, and the brevity of the final product left listeners wanting more. After all, is that not a better strategy than leaving fans hating half the material, wishing that the album had ended sooner, which far too frequently is the case with most releases these days? For the superb example of the type of precision that now seems lost, look no further than the career of Simon & Garfunkel. One could fit the entirety of the duo’s five studio releases onto two CDs, yet doing so would diminish the value of the individual efforts. Taken alone, the albums run the gamut from charmingly good (Wednesday Morning, 3 AM) to absolutely perfect (Bookends and Parsley, Sage, Rosemary, & Thyme), but placed within the context of a 2-hour, 40 minute listening experience, the music becomes tedious for all but the most dedicated fan. If that’s what happens to a group as good as Simon & Garfunkel, imagine how ridiculously unappealing it must be to hear an 80-minute, single-disc outing from a mediocre band with one good song. In other words, more music doesn’t always make an album better; it just makes it longer. 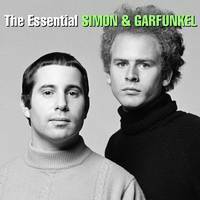 That said, here is what fans need to know about The Essential Simon & Garfunkel. First and foremost, there’s nothing new to be found on this set, so for those who already own the group’s five studio albums, a wiser selection would undoubtedly be the concert recording Live From New York City, 1967, released last year. The best bet for the most casual fan simply seeking the hits is The Best of Simon & Garfunkel, which augments the duo’s 16 Billboard-charting singles with only four additional tracks. Everyone else strongly should consider The Essential Simon & Garfunkel, which expands upon the "best of" compilation to form a two-disc effort by including an additional 13 tunes from the duo’s catalog, including gems such as Bleecker Street, Leaves That Are Green, A Poem on the Underground Wall, and Keep the Customer Satisfied. Though it focuses primarily on songs that appeared on Simon & Garfunkel’s masterpieces (Bookends and Parsley, Sage, Rosemary, & Thyme) as well as what is undoubtedly the performers’ most popular outing (Bridge over Troubled Water), The Essential Simon & Garfunkel is unquestionably the most intriguingly complete collection for those on a budget. It perfectly captures the evolution of the group’s career as well as Simon’s exquisite songwriting style, tracing the duo’s beginnings as New York folkies and following them through their experiments blending Beatle-esque psychedelia with folk-rock as well as their subsequent rise to become grandiose pop stars. Although there isn’t a single dull moment on the album — the melodies are simply too sweet, the harmonic convergence of their voices too gloriously beautiful — one certainly could quibble that, perhaps, Cloudy, Flowers Never Bend with the Rainfall, Patterns, April Come She Will, Save the Life of My Child, and Punky’s Dilemma are also vital and worthy of inclusion. Then again, those making that point might be inclined to own the entire catalog anyway.